I’m coming off the high of the World Fantasy Conference last weekend in Washington, D.C. Monday I posted on Heroines of Fantasy about the unforgettable experience of hearing Patricia McKillip read from her new novel. Today I’m going to rave just a little more, this time about Guy Gavriel Kay. First, a confession: I had a dismal knowledge of fantasy literature when I started writing. I’ve always been a reading omnivore, taking in little of everything and rarely sticking to a single story type. At the time I began crafting Eolyn, my genres of preference were history and historical fiction. Because writing was a hobby, I didn’t worry about this. It wasn’t until I was nearly done with Eolyn that it occurred to me I might try publishing. That’s when I sought out a speculative fiction writers group, so I could get some idea as to whether I had anything new and interesting to offer. Within a few months of joining that group, the work of George R.R. Martin came to my attention. I was struggling with the issue of how to embed history without bogging down the plot. Martin was recommended to me as a good example to learn from. He would also, unbeknownst to me at the time, become my very first brush with greatness. I met George R.R. Martin at ConQuesT in 2010. By then I had read three of his books. He gave me a full 15 minutes of chat time, a humble experience that left me starry-eyed for days. Looking back, I now know this was a final window of opportunity. A year later, the HBO series Game of Thrones was released. By the time Martin returned to ConQuest in 2013, he no longer had 15 minutes of chat time to give. There was no chat time with Guy Gavriel Kay this past weekend, either. All I did was attend an interview with him at the con. Later that evening, I asked him to sign two copies of his books. This was enough, more than enough, to qualify as a brush with greatness. Kay’s words and ideas, combined with a certain humble and gracious presence, linger despite the brevity and distance of these encounters. As with Martin, I really did not know who Kay was until well into my own journey as an author. I heard about him a few years back when a reviewer compared my stories to his. Always curious to find out who I am unintentionally imitating, I’ve had Kay on my TBR list ever since. It wasn’t until this past weekend, however, that I finally sat down with one of his novels. I’ve known authors to get discouraged when they come across a writer whose work reflects their own. I suppose there was a time when I harbored that sort of anxiety. By now, I’ve come to realize there is more than just a niche for the work I do, there is a true need. Listening to an interview with Guy Gavriel Kay, who not only writes the sort of story I aspire to, but has made an extraordinary success of it, was in no way discouraging. On the contrary, it gave me another companion along the way. 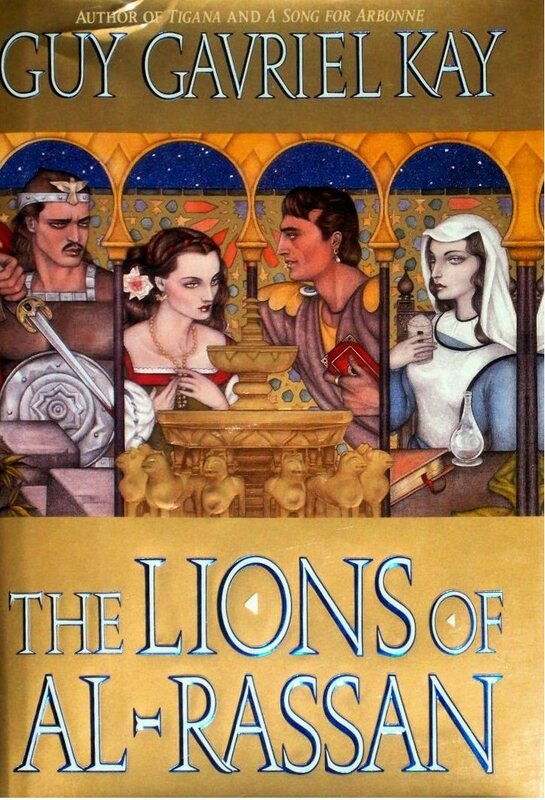 Now as I sink into the delightful narrative that is The Lions of Al Rassan, I wonder whatever possessed that reviewer all those years ago to compare me to the extraordinary author of this enchanting tale. I do not have Kay’s finesse or his mastery. Though I’d like to believe I have the potential to get there someday. Yet there’s something we do share, a certain commonality of intent. Perhaps that’s what my reviewer noticed as well. What I want to accomplish with my writing is reflected in Kay’s work. It is a reflection compels me to move forward with the promise of possibility. Even if I don’t quite make it to my destination, authors like Guy Gavriel Kay assure me I have chosen the good journey. And I’ve always believed it’s the journey that counts the most. Kay has long been my go back to guy. I revisit his works almost yearly. Tigana, Song for Arbonne, Lions…he never disappoints. Great post! Thank you, Mark! I’m so happy you stopped by to visit my new virtual office. 🙂 I see a lot of Guy Gavriel Kay in your stories, as well. Stay the course. I’m looking forward to that next novel. Tigana transformed the way I read, the way I write. Until then, there was good and evil. After reading Tigana, there were so many layers in between. It gave me the greatest lesson I have ever gotten as a writer, and maybe even in life itself–good and evil depends upon whose eyes one looks out from. I have always been exceedingly grateful to the incomparable Kay for this. He and Patricia McKillip tie for first place in my favorite writer’s category. Read the Finoavar Tapestries, and read Tigana. You must!